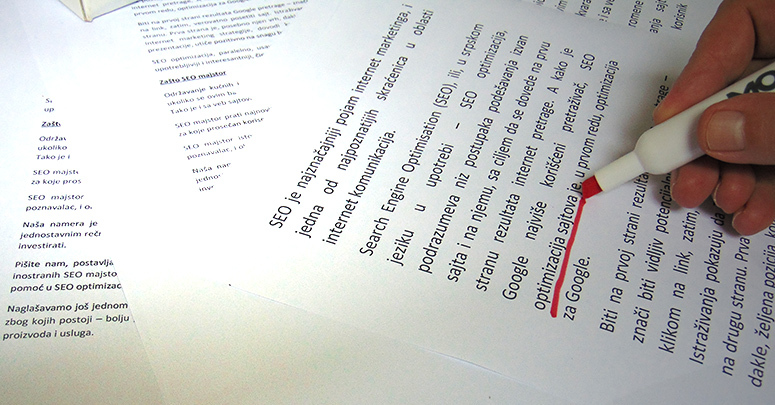 Neparno 10 is one of the leading firms when it comes to SEO in Serbia. Hence, we consider SEO optimization for Google as the primary service that we offer to our clients. We specialize in SEO for Serbian language and have succeeded to help a lot of clients to be on top of Google search results. In order for your site to achieve better ranking in the Google search engine, we implement an established procedure alongside with a set of techniques.It is a continuous process and cannot be done overnight. We regularly write articles about our experiences, news about SEO and other useful information related to it in our blog seoptimizacija.com . The packages that we offer to our clients is on a monthly basis as it takes constant work to optimize a site, both on-site and offsite, to secure a position in Google search results. With regards to establishing a plan of action, each website requires a thorough analysis. The procedure will be tailored specifically for the nature of business. Few revisions will be required during the process which will be done in accordance to changes with Google algorithm and results from Google Webmasters Tools and analytics.